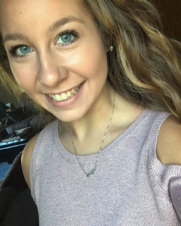 Emily Bielesz, from Newington, CT, is a student at Southern Connecticut State University studying English education. Emily is a past member of the SCSU Dance Team. She is also a former member of the Dance 10 Touring Company and Competition Team and was a part of Santa’s Workshop. Currently, Emily works for TJ Maxx in Farmington as a customer service coordinator and sales associate. She also works for Wethersfield Park and Recreation Department’s Dance and Drama Summer Program as a dance teacher for the young program. Furthermore, Emily is trained in ballet, pointe, jazz, lyrical, contemporary, and tap. When Emily isn’t doing “nose tail noses” across the floor with her students, you can find her at the beach with a good book in hand or spending time with her family.